Hi there. Today I’m sharing a review for a fantastic contemporary M/M romance from Megan Erickson. 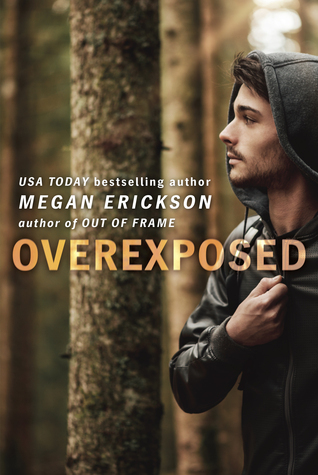 OVEREXPOSED is the fourth book in a series, but I swear you’ll love it even if you haven’t read any of the previous books. I did. It was fantastic. So…I haven’t read any book in this series before, and though it’s book FOUR I didn’t feel the lack. It was amazing, and I can’t imagine liking it any more than I do. Levi Grainger is a recent reality TV star hiking the Appalachian Trail in memory of his sister, Layla, an army gal who died on deployment. Levi idolized his elder sister, and it was her dream for them to hike the two thousand miles together. She’d planned and strategized and had tons of research on where to go and where to camp, and Levi’s so adrift after her death that he hopes to connect with her spirit on the trail. While they traverse the tough terrain, Levi’s overcome with grief over Layla, and he’s not sure if he’ll ever get over her loss. Plus, he’s confused over Thad’s interest, and Thad’s tightly guarded words and past. Thad could go entire days without speaking, it seems, which is antithetical to cordial and chatty Levi. Their budding relationship explodes, however, because Thad’s secrets can’t be held back–and that breaks Levi’s heart. Unfortunately, it’s also a moment of craptacular family problems, and Thad’s Levi’s rock through out the entire ordeal. Levi’s forced to see Thad for more than his job, and that’s a good thing. Thad has a real problem trusting people; his one and only boyfriend was a cheater. He doesn’t think Levi would do that, per se, but there’s a big separation coming due to Thad’s job, and it’s the worst kind of scenario for Levi. Should they cut their losses before they get more attached? Thad thinks so, but Levi’s a scrapper, and he’s willing to fight for the love he deserves, even if Thad doesn’t think he’s capable of giving it. The tension and love her is so high! I fell into lock-step with these guys and loved every moment of their loving, and agonized every moment of their turmoil. Both Levi and Thad are great guys in a rough patch. There are bits of humor woven in, especially when Levi is recognized by fans at perhaps epicly bad moments, but that’s so AWESOME. Because the book is intense. I really enjoyed Levi and Thad’s story, which felt raw and real and fantastic. There are other couples present in the end, and I’m sure they are from previous books which made the HEA more sweet for the series readers. For my part, I was captivated by this story, and would highly recommend. Interested? You can find OVEREXPOSED on Goodreads, Amazon, and Barnes & Noble. I received a review copy via NetGalley. Sounds fun. The fact that one can start mid-series is commendable.